Telugu superstar Mahesh Babu's Bharat Ane Nenu has created history at the Box Office worldwide. The political-thriller, which had released on Friday starred the Tollywood Prince in the titular role of a Chief Minister, Bharat. Catch had previously reported thar Bharat Ane Nenu has minted a whopping Rs. 53 crore on its opening day at the Box Office worldwide. And on Saturday, the Mahesh Babu starrer went on to collect another Rs. 47 crore across the cinemas worldwide to join the coveted Rs. 100 crore club. It's indeed a unique feat considering that Bharat Ane Nenu took just two theatrical days to hit the century mark at the Box Office worldwide. And with Rs. 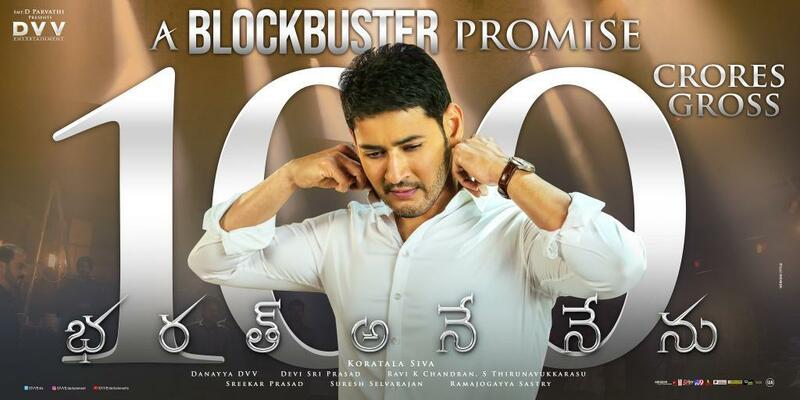 100 crore in 2 days, Bharat Ane Nenu also equalled the record set by Baahubali: The Beginning at the Box Office. On Sunday morning, the makers of Bharat Ane Nenu have officially confirmed the update by sharing a new poster with 'Rs. 100 crore gross' written on it. Be it in India or overseas, Bharat Ane Nenu is continuing it's fabulous performance at the Box Office. At the USA Box Office, Bharat Ane Nenu has already crossed the $ 2 million mark in two days and is all set to cross the lifetime collections of blockbusters Srimanthudu and Khaidi No. 150 on Sunday. Directed By Koratala Siva and produced by DVV Danayya, Bharat Ane Nenu stars Bollywood actress Kiara Advani in the female lead.